RailwaySurgery.org - Become a Railway Surgeon! 1. Complete medical school. 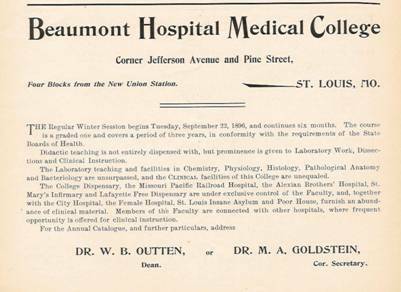 Since the Flexner Report won’t appear until 1910, you have about 160 medical schools from which to choose. Entrance requirements, course work and costs are wildly different. Try to pick a good one. 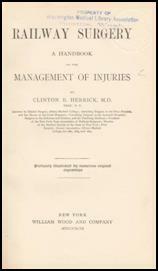 I recommend my alma mater, The University of Texas Medical Branch at Galveston, established in 1891. It’s in a good railroad town and right on the beach. 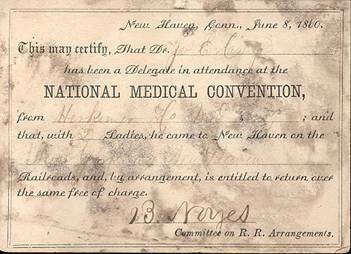 The National Association of Railway Surgeons (NARS), which you’ll be joining, held their convention in Galveston in 1894. 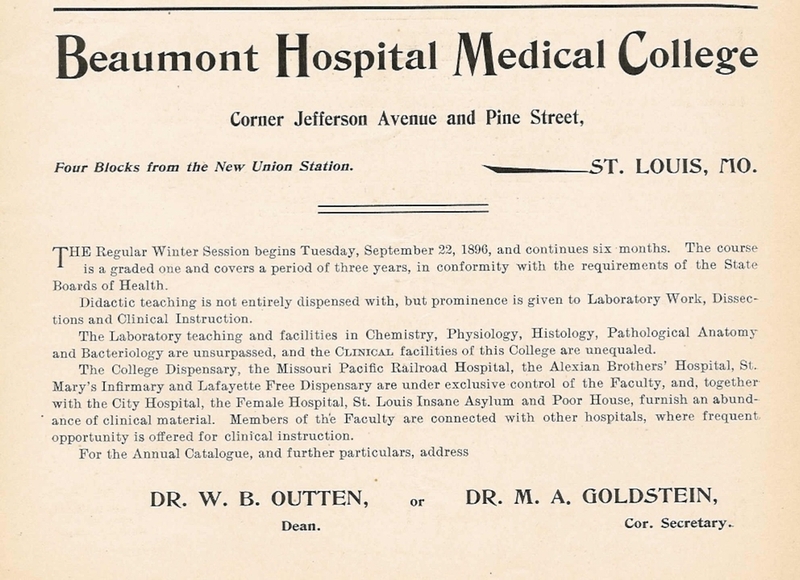 Or you might want to go to the Beaumont Hospital Medical College in St. Louis, below. 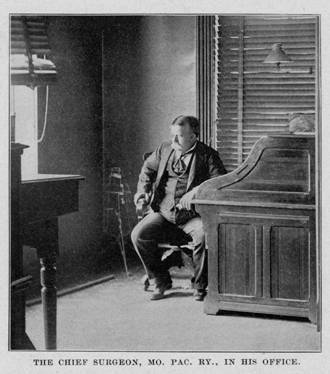 Dr. W. B. Outten, the dean (pictured below) is the Chief Surgeon of Missouri Pacific Railroad. He’s also the president of the NARS. So he’s a good person to know. 3. If you have your own practice, and the railroad comes through your town, talk to railroad officials about becoming a “local surgeon.” As a local surgeon, you will have a contract with the railroad to be one of the first responders to any type of accident or injury on railroad property. You can continue your regular practice, but you’ll also be on call for the railroad at all times. Of course, you won’t have to carry a pager or cell phone – those have not been invented yet. If the railroad needs you, it will likely summon you by sending someone to knock on your door. 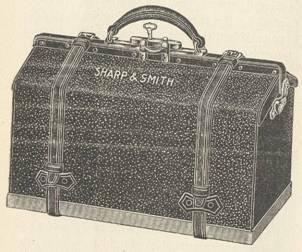 You’ll need a well-stocked bag such as the one below to take with you to emergencies. Caution: Expect at least a little friction, perhaps a lot, from the other doctors in town. They won’t like the idea of you working under a contract for negotiated rates. 4. Want to be a full-time railway surgeon? Apply for a job with the railroad. If they hire you, they will probably assign you to one of their large regional hospitals (see list and image gallery), where you will join a medical staff of several other doctors and dozens of nurses. They might also place you at an “emergency hospital.” These are small urgent-care facilities, usually located around railroad stations were yards. At an emergency hospital, you will be the only doctor, with one nurse to assist you. 5. 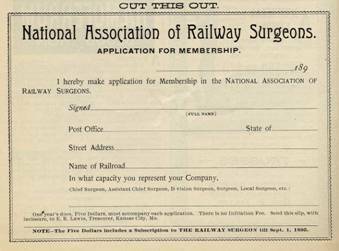 Now fill out this application to join the National Association of Railway Surgeons (NARS). 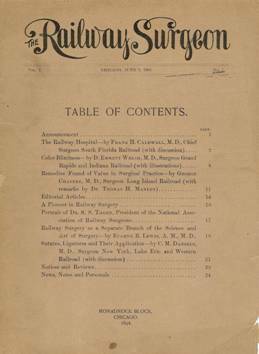 As a member, you’ll get a subscription to your journal, The Railway Surgeon. Published twice a month, it’s full of interesting and educational articles. 6. NARS will also send you your membership card. 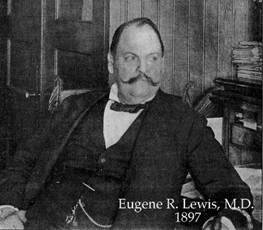 Dr. E. R. Lewis (pictured below) is the secretary of NARS. He has signed your card on the left-hand edge. Be sure to carry your card with you, and consider growing a handlebar mustache. You can skip the mustache if you’re a woman. 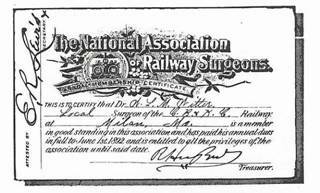 Does railway surgery have opportunities for women in 1900? Indeed, in 1894 the Northern Pacific appointed Dr. Carrie Lieberg of Hope, Idaho as division surgeon, and in 1907 the St. Louis, Brownsville and Mexican Railway in Texas will hire Dr. Sofie Herzog as their chief surgeon. 8. 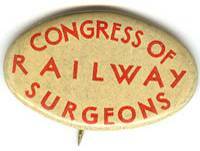 At the meeting, you’ll get to meet other railway surgeons. 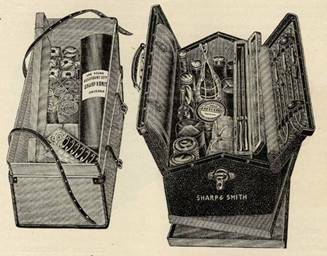 You will also see exhibits from drug companies and manufacturers of medical equipment. 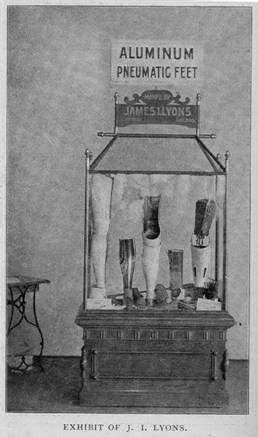 Here is a display from a company selling artificial limbs. Be sure to pick up their catalog - you’ll prescribe quite a few artificial limbs at your new job. 10. 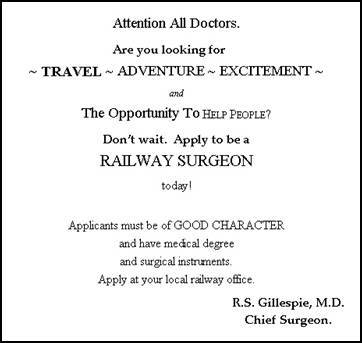 Now enjoy your satisfying career as a railway surgeon! A century from now, some crazy doctor in Texas will create a website about you. Railway surgeons like to have fun, so try our RailwaySurgery.org Word Search Puzzle while you’re waiting for your train. If you get stuck, we have an answer key.